Abraham Kimball was the son of Benjamin and Mercy Hazeltine Kimball. He was born on 24 March 1678 in Bradford, MA. The ancestry of his wife, Mary Green, has not been determined. I thought at one point I had her figured out, but I am not sure. So, here is what I know and/or think I know about Abraham and Mary. In about 1695, long time bachelor, Nathaniel Gage, aged about 50, of Bradford, finally married. His wife was Mary Green. In a deed signed 29 Dec 1699 Andrew Mitchell and his wife Abigail, of Charlestown, sold to Thomas and John Green, formerly of Malden, their land in Bradford. On 7 August 1700, Thomas Green married Hannah Hazeltine, daughter of Robert Hazeltine, Jr. of Bradford. John might have been already married at the time of their arrival, as there is no Bradford marriage recorded for him, but his wife's name was recorded as Rebecca on their land deeds. On 8 May 1700 Abraham Kimball of Bradford married a second woman named Mary Green. So, who were these people named Green and were they all related to each other. The deed states that the two men John and Thomas were lately of Malden. When Thomas died his brother Ebeneezer Green was involved in the probate as was a Samuel Palmer, who was married to their sister Elizabeth Green. Ebenezer identified his father as Thomas Green of Malden. Now there were a couple of Green families living in Malden at that time. Of those families one in particular seems to be a match to the Greens that moved to Bradford. On 22 March 1676 a Thomas Green married Mary Weeks in Malden. They had five children: Thomas, John, Mary, Ebenezer and Elizabeth. Thomas Sr. died in Malden on 28 April 1694. This then would seem to be our Green family. There is one hiccup which I'll talk about later that might cause a problem for the Mary who married Abraham. On 8 May 1700 Abraham Kimball and Mary Green got married. He was 22 and she was 17. Seven months later their first child, Mary, was born. Hum, was this a shotgun wedding? Two years later, Mary gave birth to a second child, a son they named Ephraim and in 1705 another girl was born and given the name Mehitabel. Some four years before his marriage, Abraham's father, Benjamin Kimball, died a fairly wealthy man. Abraham inherited land and a part share in a sawmill from his father the total value of which was around 43 pounds. In August 1706 John Green sold Abraham land in Bradford at at cost of 6 pounds. And, in February 1707 his younger brother Samuel, sold him his land and share in the sawmill that he had inherited from their father. So far so good, Abraham is able to buy more land and his family is growing. But Abraham's story doesn't end well. He died age 30 on 25 Feb 1707/08. Abraham's estate was inventoried in June 1708 and valued at over 300 pounds. He had cows, pigs, sheep, horses, and a yoke of oxen. He had also bought land in Haverhill. His widow, Mary, was only entitled to a third of the estate, commonly called the Widow's third. The other two thirds would be divided between her children. Even the house was divided, Mary could live in the bottom rooms of the house. She could use the east end of the barn. Of course her children were very young at the time, they would not get their inheritance until they came of age. Abraham's brother Samuel was appointed guardian of her son Ephraim, the girls were not given a separate guardian. Mary was still a young woman when her husband died, only about 24. She did as most young widows, remarried within a year of her husbands death. Her second husband was 23 year old James Tiler (Tyler), they married in Bradford on 19 Jan 1708/09. Their first child was born 11 months later; a girl named Dorothy. The next child, at least the next living child, was not born until 1712. The baby was a boy and he was named Abraham in honor of Abraham Kimball, which was a common naming pattern. The first child of a second marriage was frequently named for the deceased partner of the husband or wife. According to the Tyler Genealogy, James Tyler began buying and selling land in Maine by 1716. He must have been travelling between Bradford and Maine for some years. He first had land in Cape Porpoise which is near Kennebunkport. Today it is only about 60 miles by road, but he probably traveled by boat up the coast. In a 1721 deed he styled himself as James Tyler of Bradford, alias Arundel. The to and froing from Bradford to Maine might explain why Mary did not give birth again until 10 September 1721. She and James had another daughter who they named Abigail. Three months later, on 17 December 1721, Mary died. She was 38 years old. James, left with three small children, one of whom was a three month old infant, did what most men did; found himself a new wife. He married Phoebe Royall by 1724. He also permanently removed to Maine. Phoebe had only one child, a son named Royall Tyler. In his will written in 1748, James divided his estate leaving some land to his oldest son Abraham and to his well beloved son Royall. James explains in his will that he is not giving Abraham a larger share because he "hath proved to be a very undutiful son to me". It is clear by his will that Mary's daughter Dorothy Tyler Leavitt was dead by 1748. He left a bequeath of land for her children. Abigail was alive and married and she received land as well. 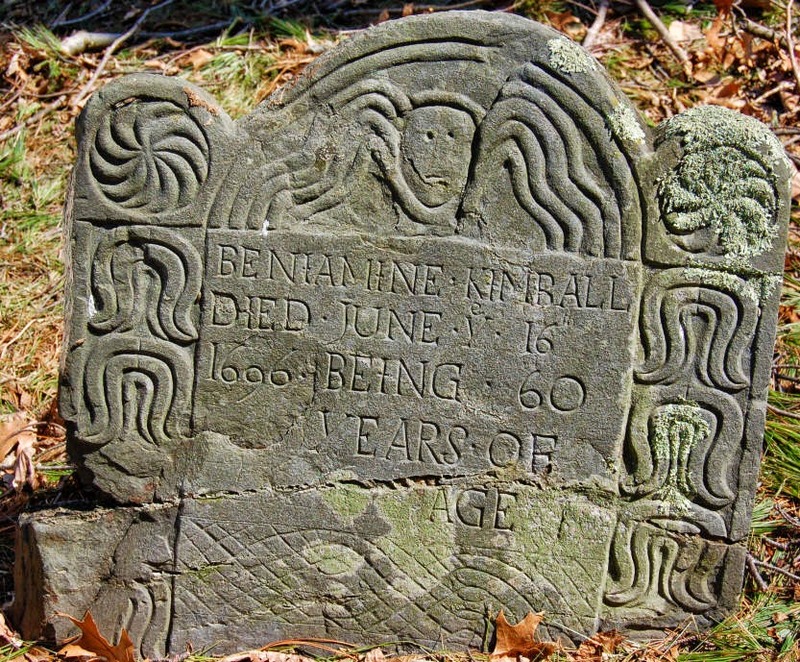 Mary's Kimball children lost not only their mother in 1721 but also soon said goodbye to their step-father and their half sibling who moved off to Maine. I wonder if these two sets of children every saw or heard from each other again. In 1721 Mary was 21, Ephraim was 19 and Mehitable 16. But Mary's childen had grown up fast. Mary Kimball, her eldest daughter, married at the young age of 17. Her husband was Edmund Chadwick of Bradford. Mehitable, her sister, married at age 16 to Obadiah Perry of Bradford. So, back to the Green family. Mary Green Gage gave birth to two more children. They were Mary and Nathaniel. This is my sticking point on whether or not Mary Weeks Green Gage, and finally Jewett, was the mother of Mary Green Kimball. Would she have named two daughters Mary? They were separated by about 15 years and two last names. It is possible that Nathaniel Gage wanted his daughter named Mary. If she wasn't the daughter of Mary Weeks Green then who was she? There were no other Green families in Bradford and the closest ones were in Salem, about 24 miles away. How would 22 year old Abraham meet and court a girl so far away. All the other Green children moved to Bradford and this explanation works best for me, but this is just an opinion. The Middlesex probate records reveal that Mary Green Gage was the wife of Thomas Green of Malden and that they had a daughter named Mary. She was alive and living in Bradford in 1699 and I am positive that she married Abraham Kimball. Sometimes all we can find about our ancestors is the date of their birth and death, if we are lucky. Several hundred years ago, these dates were not as important as they are today and so may have gone unrecorded. Benjamin Kimball was the youngest son of Richard and Ursula Kimball of Ipswich, MA. A cursory search of the internet will tell you that he was born on 12 May 1637. A check of ancestry.com show hundreds of family trees that include Benjamin and his birth is listed as 12 May 1637. So how do they know this, where does this date come from and more importantly is it correct? Benjamin's parent's were born, raised and married in England. They already had a large family including eight children when they decided to risk their lives and their fortune on starting a new life in New England, and it paid off. Richard was a successful wheelwright/farmer who quickly began accruing land. Ursula gave birth to three more children, Caleb, Benjamin and Elizabeth. 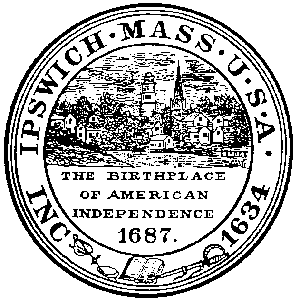 They were born either in Watertown or Ipswich and their births went unrecorded. Since most women of child bearing age gave birth about every two years, the birth years of these children are estimated as 1635, 1637 and 1639. Where did May 12th come from? I think I know, but we''ll get to that later. Henry, first born child of Richard and Ursula was a married man when Benjamin was 3. He was born in 1615 and died in 1676 age 60. He remained in Watertown when his parents left for Ipswich, but he followed them some years later, eventually settling in Wenham. His father left him 90 pounds in his will. Richard Kimball Jr. was born in 1622 he died in 1676, age 54. Richard also settled in Wenham and at one time was the wealthiest man in town, paying the largest tax rate. Richard received a bequeath of 40 pounds. John was born in 1631 he died in 1698 age 67. He lived and farmed in Ipswich, but bought and sold land in adjacent towns including Salem. He inherited 25 pounds from his father. Thomas was born in 1633 he was killed by Indians in 1676, he was 43 years old. He had first settled in Wenham but eventually moved to Bradford. He also had purchased a 1/4 interest in a sawmill on Oyster River in Hampton, New Hampshire in 1653. he lived there for some years before moving to Rowley in 1660. He also seems to have been the first of the Kimballs to venture into New Hampshire. Hampton is only about 20 miles to the north. He received 25 pounds from his father. It is interesting to note that Thomas' father Richard married the Widow Margaret Dow of Hampton in 1661, did Thomas introduce them? Caleb was born in 1635 in Ipswich, he died in 1682 age 47. He was a prosperous farmer and lived in Ipswich. He too bought and sold land including his older brother Richard's house and land in Ipswich. Caleb was the only son to actually receive land from his father. Benjamin last son, born in 1637, he chose to settle in Bradford where he died in 1696 age 59. He received 25 pounds from his father plus two oxen which he had received prior to Richard's death. Only one of the six brothers lived past his 60th year, Benjamin made it to 59 and the only brother to outlive him was his older brother John who died two years after him. Three of his brothers died in the same year 1676 only a year after the passing of their father. Benjamin made his living working as a carpenter. I have read that he lived briefly in Exeter, NH but I cannot find any proof or documentation of this. He lived in Salisbury for a few years but settled in the section of Rowley, known as Merrimac, that eventually became the town of Bradford. Some of the land he owned in Bradbury butted up to the Merimack River and his father in law, Robert Hazeltine was a neighbor. So, how did he come to own the land. Every bio of Benjamin includes the statement that he bought land on 12 May 1663 from Elizabeth Starrett of Haverhill. Is this where the date attributed to his date of birth of comes from? Hum, might be. Benjamin is also said to have bought some of his brother Thomas' land in 1667. I cannot find these deeds. The location of some of his land is described in an Essex County Court recording of a 1664 deed of land bought by Abraham Perkins. This deed was not recorded in the Essex Deed Book either. If anyone knows where these deeds are recorded Please let me know. In 1669 Benjamin and Mercy sold 40 acres of their land back to the town of Bradford. This land was intended to support the new town minister. Judging by the deeds registered by his sons, after his and Mercy's deaths, Benjamin had quite a bit of land in Haverhill, Bradford and Amesbury. In 1659 Benjamin and his brother Thomas were deponents in a lengthy court case involving Henry Green of Hampton and William Edmonds of Lynn. Henry it seems had a daughter Mary who had a nasty sore on her lower leg. Henry had taken her to see Mr. Charles Starre, a doctor in Charlestown. He was unable to heal the wound. Henry then took her to the home of William and Ann Edmonds. Ann said that she could cure the sore and Henry agreed to pay them with a colt. Mary stayed with the Edmonds in Lynn for about one year. The cure for her leg, which Ann said suffered from "the King's evil", which was thought to be a tuberculosis infection of the bone, include removing about 5 inches of her leg bone. From the sound of it, it's amazing that she survived the treatment, but Ann Edmonds was by all accounts a competent care giver and ran a quasi-hospital out of the tavern she ran with her husband. When Mary was deemed as cured as they could get her, Willliam Edmonds asked for his colt. He got one, but not the one he wanted. All this played out over several years in court. Thomas and Benjamin testified on multiple occasions about what they had seen or heard. When William finally got the colt he asked Benjamin, who lived in Salisbury to keep it for him. He apparently really like it, because in 1662, William Edmonds took Benjamin to court to try to get the colt back. Okay, back on track here. In 1660 Benjamin's brother Caleb married Anna Hazeltine of Rowley. In 1661 Benjamin married her sister, Mercy. They were the daughters of Robert and Ann Hazeltine. Mercy was born 16 August 1642 in Rowley. Benjamin and Mercy settled in the area of Rowley that would become Bradford. Some of Benjamin's land bordered that of her father's. Thomas Kimball also lived in Rowley. Life was hard, but at least Benjamin and Mercy had family nearby. Benjamin and Mercy had 11 children, 10 of whom lived to adulthood. 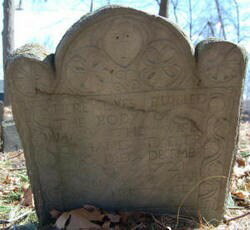 Two died relatively young, Abraham age 29 and Ebenezer age 30. Their brother Richard, who was very active in Bradford died age 46, Anna lived the longest, dying at age 83. The births of children whose names are starred are recorded in either Salisbury or Bradford town records. Richard's date of birth is up for grabs, I have seen two different dates. Still standing today, in the heart of what was Bradford, is the Kimball Tavern. Built by Benjamin in about 1690, it was in the family for at least 200 years. Today it is an antiques store but it is wonderful to see it has been preserved. As early as 1680, Benjamin had been "licensed to keep a public house of entertainment for strangers and others and to draw beer and cider". 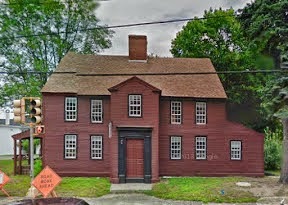 The tavern was on a key road that went from Portland, Maine down to Boston. It would have been an ideal stopping place before crossing the Merrimack River. Today the area once known as Bradford is part of the City of Haverhill, and the Tavern is quite close to the river on Salem St. at it's junction with Main St. It is said to be haunted by members of the Kimball family. The town of Bradford had hired a Mr. Symms to preach in 1669, but he was not an ordained minister, and it seems for this reason they were not officially a church. On 31 Oct. 1682 a group of local ministers, from Salem, Ipswich, Rowley an elsewhere came together in Bradford to determine whether or not Mr. Symms was up to snuff. They advised the community that they thought he was an acceptable candidate and the community agreed by unanimous vote on 28 November. On 27 Dec 1682 the church was officially organized and Benjamin Kimball was one of the first male members to sign the covenant. Mr. Symms was ordained the same day. In January of 1682/83 the first women of the town were made full members including Mercy Kimball. Benjamin took his freeman's oath, which was dependent of full church membership, on 25 March 1683. Benjamin died on 11 June 1696. He was buried in the Bradford Burying Ground. He was 59 years old, young by today's standards. He was lucky he only buried one child, the infant Mercy. His wife, died some eleven years later on 5 Jan 1708. 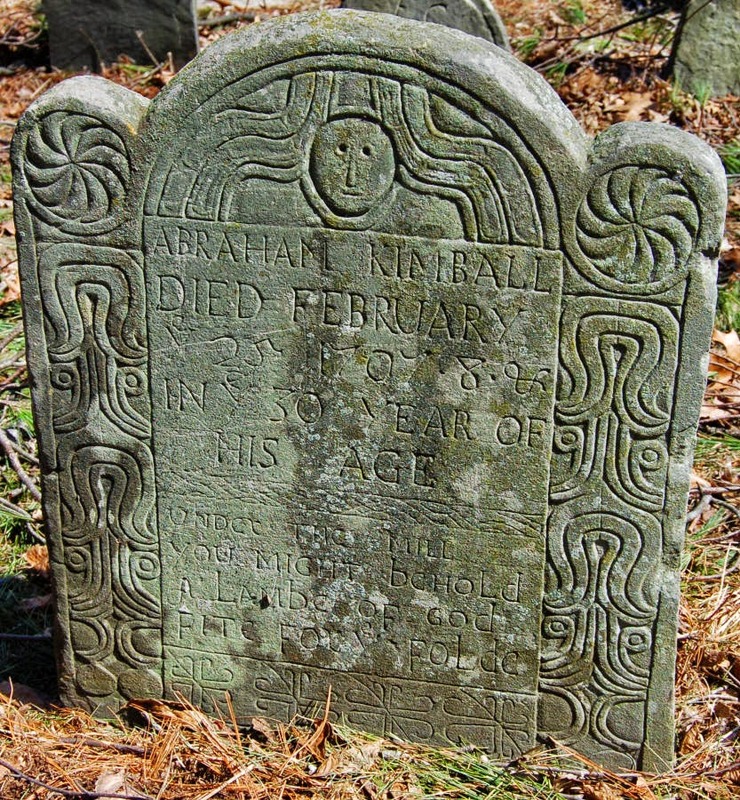 Her son Abraham, my ancestor died the next month at the very young age of 29. They too are buried in the Bradford cemetery. Benjamin died a fairly well off man, but he doesn't seem to have written a will. His estate was inventoried on 3 July 1696 and the land was divided between his widow and his children. The estate was valued at over 1000 pounds. After Mercy's death the rest of the land was divided. If his grandfather Richard Kimball had remained in England, his grandson Benjamin would never had been able to accrue such a large amount of land and wealth. But the riches came at a great cost. The very real fear of Indian attacks, disease and other calamities were an every day part of life. Death lurked around every tree and bend in the road. Gage, Thomas, "The History of Rowley Anciently Including Bradford, Boxford and Georgetown, from the year 1639 to the present time", Boston, 1840. As I was writing the history of Richard Kimball and his family, I was struck by the impact that King Philip's War had on his children and their families. Most people I know have never heard of this war, the first of several Indian wars that plagued the early New England Colonies. I am currently reading a history of the war by author Jill Lipore, who describes the events leading up to the war and the colonist's perception of the fight, so it really caught my attention when the year 1676 kept coming up in the Kimball family bios. This war is believed by some historians to be one of the most significant fought by our ancestors. Waged by a confederation of Native Americans led by Metacom, known as King Philip, it threatened to wipe the colonies of Massachusetts, Connecticut, Rhode Island and Maine off the map. 12 towns were completely destroyed and many others damaged, hundreds of colonist, including men, women and children were killed and the economy was brought to the edge of ruin. Thousands of Native Americans were killed, including women, children and the old and many more were sold into slavery after the war. Both sides were responsible for heinous acts of brutality. The war began in 1675, the year that Richard Kimball Sr. died. It was a short war by today's standards, it was all but over when Metacom was killed on 12 August 1676. There was sporadic fighting until 1677 in Maine. But, it took longer than the Colonies leaders anticipated, they thought they could squash the fighting in a matter of weeks. When the death toll began to mount they realized that had a true crisis on their hands. Men of fighting age were recruited from all over, some were volunteers but many were servants or apprentices, poor men, men new to town, trouble makers and other expendables who were impressed into service. Many of them hadn't a clue about about fighting and some did not even owe a gun. This is one of those days that the participants would want to holler we want a do-over. Captain Thomas Lathrop and his men from Essex County were escorting men and grain in the Connecticut Valley. The wagon train was had left Deerfield on it's way to a garrison at Hadley when they were caught with their "pants down". The men had stopped for a rest while the carts were crossing "Muddy Brook", finding wild grapes growing along the water's edge they put down their weapons to enjoy this treat. Unbeknownst to them, they had been closely followed by a band of Indians who took full advantage of the situation. Captain Latrope and most of his men were massacred. Only a handful of the 80 men survived. Among the dead was Caleb Kimball, grandson of Richard and son of Henry Kimball. He was 28 years old. One of the few survivors that day was Robert Dutch, the husband of Mary Kimball Dutch, daughter of Richard. Others say it was Robert Dutch Jr. which would make more sense. Robert had been shot, "mauled by hatchets", stripped and left for dead. He was found by Captain Mosley and his men the day after the battle and eventually returned to health and his family in Ipswich. Muddy Brook was known as Bloody Brook thereafter. 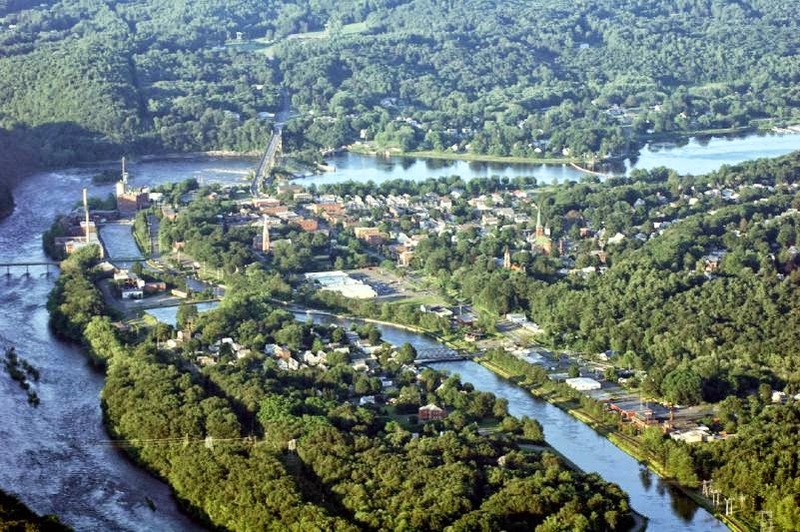 On this day the town of Groton was attacked. Richard Sawtell's garrison house was burned to the ground. He and his family were forced to evacuate to Watertown. When the war ended, he and his family chose to remain in Watertown, and never returned to Groton. Elizabeth, the wife of Richard Sawtell, is said by some to be the daughter of Richard Kimball, however this remains unproven. In an isolated, but still deadly attack, three "praying Indians", those that the English thought they had converted to Christianity, attacked the Rowley home of Thomas Kimball, son of Richard Kimball. Thomas, age 43, was killed. His wife and five children were taken captive, but luckily were returned home after about 40 days. On 18 May 1676 Captain William Turner and about 150 men attacked a sleeping village of Indians. The end result of the attack was the slaughter hundreds of mostly Indian women, children and the elderly with the loss of only one Englishman. The noise of the battle however alerted nearby groups of Indians also camped along the Connecticut River. The following day these Indians launched an attack on the English, who had not mapped out an escape route in the event of trouble. The English unable to agree on an escape route and unwilling to stay together splintered into many groups fleeing from their attackers. The end result was the death of William Turner and at least 40 of his men, including Joseph Fowler, husband of Martha Kimball Fowler, daughter of Richard Kimball. This day is remember by Native Americans as the Turner Falls Massacre. Other Kimball's who fought in and survived King Phillip's War include Richard's grandson Thomas Kimball, son of Richard. He served in three expeditions during the war. His first cousin Henry, son of Henry of Wenham and brother of Caleb who was killed at Bloody Brook also served in the war. This little known war was a defining moment in American History. Many historians believe that the events of the war were a catalyst from which emerged the the beginnings of the American identity. The English colonist realized that they were going to have to rely on themselves and not their fellow countrymen back in England for their survival. The other victim in this war, if you can call it that, was the very identity of the Puritan colonist. After they arrived in New England the Puritan's had held themselves up against the behavior of the Spanish Conquistadors and had judged themselves superior in their treatment of the native population. They were not like the bloody, cruel Spanish, they had a different more humane way of dealing with the Indians. The events of King Philip's War, from the Great Swamp Massacre to the Battle of Turner Falls proved them wrong. We I read this it seems to come across as harsh and judgmental, it's not meant to be. There are two sides to every conflict and those who fought, died and survived King Philip's War are long, long dead. The English, the victors, left their version of the events but the losers, the Indians, had no one to write their story. Both sides fought for their survival, their future, the Kimball's side won, we won, and we are who we are because of this little war.